Take a few minutes to look over the questions most frequently asked by our customers. If you do not find a solution here, submit your problem to our team to get the answers you need, fast. My Engineered flooring boards appear to be swelling. What is causing them to buckle? Excessive moisture will cause a hardwood floor to swell. Although an Engineered floor is stable in a higher humidity range than a solid wood floor, the relative humidity must be controlled. Before installing a wood floor, you must check the relative moisture of the subfloor and the air to ensure that they are within the recommended levels. These moisture levels must be maintained all year round. Use a hygrometer (relative humidity indicator) to check moisture content in the air to ensure that relative humidity is within the recommended range. I have found a few scratches and dents on the hardwood floor in my kitchen. What can I use to repair my Mirage wood floor? Touch up kits for minor repairs are available at your local Mirage dealer. If they are out of stock, your dealer can order them for you. The kits include an instruction guide, a buffer, a marker, a wax crayon, and a small bottle of polyurethane finish. Board replacement should be considered for larger repairs. Use our Mirage dealer locator to find the dealer nearest you. Sound insulation is important in my condo. What can I expect from my Mirage Lock floor in terms of sound transmission? We are very proud of Mirage’s excellent acoustical test results. Our floor boasts an FIIC (Field Impact Insulation Class) of 63 dB and an FSTC (Field Sound Transmission Class) of 56 dB. The tests were conducted according to ASTM and ISO standards for impact and airborne sound transmission. These results were achieved when testing Mirage Lock installed on an Ulti-Mat membrane over a single 8" concrete slab. Results exceed the recommendations of most condominium associations. What kind of rug can I use on my hardwood floor? Use only colorfast throw rugs or area carpets, meaning that the dyes will not bleed. Make sure that the rug or carpet does not have a rough rubber backing. Soft, synthetic backings are safe to use provided that they have holes that allow the floor to breathe. Make sure you clean regularly underneath the rug or carpet to remove dust and other abrasives. To prevent color changes in the wood due to intense light, move the throw rug or area carpet occasionally. Always check with the rug manufacturer to choose the right pad and ensure that they guarantee the product selected. Can a hardwood floor be installed over an existing vinyl floor? Installing hardwood over vinyl is not a trouble-free option. It really depends on how well the vinyl is adhered to the subfloor and whether it is cushioned or not. If the vinyl is not properly adhered to the subfloor, it could cause the wood floor to separate from the subfloor. If the vinyl is cushioned, it could cause the hardwood floor to squeak. For best results, a wood floor should be installed over a clean, flat, sturdy subfloor that meets the manufacturer's recommendations. See our installation guides for more details. What kind of wood floors can be installed on a concrete slab? With the development of new wood flooring technology, you can now install an Engineered or Mirage Lock floor on concrete. The use of proper installation methods will ensure the beauty of the wood floor for many years to come. Using the recommended adhesives combined with compatible moisture vapor protection will ensure trouble-free installation of Mirage Engineered floors. Wood floors have never been easier to install now that the Mirage Lock floor has arrived. Once the recommended underlayment is rolled out over the concrete, you simply lock the boards together without the need for nails or adhesive. Installing Mirage Classic solid 3/4" (19 mm) thick wood floors over concrete is not recommended. I really like your products and I'd like to see some samples. Where can I see samples and purchase a Mirage Floor? You can find your local retailer by using our Mirage dealer locator , or you can contact us by phone. You can also order online up tu 6 individual planks for $19.95. I’m getting ready to install my Engineered wood in the basement. It’ll be glued down over concrete. What size trowel should I use for the glue? Trowel recommended by adhesive manufacturer as tooth size is important for ensuring optimal strip adherence to subfloor. Do I need to acclimate my floor before I install it? Prefinished hardwood floor installation requires a little more time and precaution than unfinished flooring; handle with care to avoid board surface and finish damage. Note: Keep sealed boxes of wood in room where flooring is to be installed for at least 24 hours before installation. I was reading your installation guide and I’m wondering what the black felt paper is used for? The felt paper is used to reduce and delay transmission of humidity from the subfloor to the wood flooring. I'm really interested in getting one of your floors for my home, but I'm trying to budget everything and I'm wondering how much a Mirage floor costs? The price of a hardwood floor depends on a host of details including the selected species, board width, finish, and area to be covered. 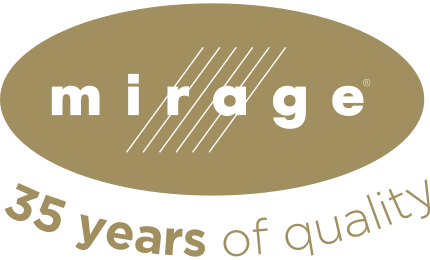 We invite you to visit your local Mirage dealer to discuss your project and get a quote. I’m a little concerned about my hardwood being damaged by humidity. What can I do to protect my floor from moisture coming up from the subfloor? Before installing a Mirage floor, the subfloor should always be tested to ensure that it is at the correct moisture level. All potential sources of moisture should be eliminated in order to avoid future moisture problems. Moisture vapor can be used when moisture is an issue. However, relative humidity should still be monitored. I know that your finish is long lasting and wear-resistant, but I know at some point I’ll have to refinish my floor. How often can I re-sand it? Both Mirage Classic and Engineered floors can be sanded from three to five times. Mirage Lock cannot be sanded. I’m redecorating my living room and have already chosen Mirage Maple Sierra flooring. Is it possible to get matching moldings? Yes! We make many moldings and accessories. You can view them in the “ Floors ” section under “Moldings and accessories.” They are available from your Mirage dealer. I had a Mirage floor installed and I love it. But I noticed recently that if I look at it at a certain angle, it looks ribbed. The wood boards are cupped. It wasn't like that a few weeks ago. Why is my floor cupping? It is likely that cupping (the long edges of the board curling up) will occur if the humidity level of the subfloor or the relative humidity in your home is either too low or too high, depending on the type of flooring that is installed. You can see cupping if it is too humid for a Classic floor or if it is to dry for a Engineered or Lock floor. It is best to maintain relative humidity at 45% at all times in your home. Engineered flooring is more tolerant of moisture variations and will remain stable between 40% and 60% relative humidity. Mirage Classic (3/4” solid) and Mirage Lock will remain stable between 40% and 50% relative humidity. The installer just left and although he wiped the excess glue off the floor, there are still a few boards with glue on them. How do I get the glue off the floor? It is crucial to clean off excess glue as you install the floor. Use the cleaner the glue manufacturer recommends or use mineral spirits, acetone, or lighter fluid with a clean white rag. You should always use these products sparingly, with care, and test them on a hidden area to make sure they don't damage your floor. I’m redoing my living room and thinking of new hardwood floors. What color and finishes are available from Mirage? You can browse our products in the “ Floors ” section of this website. Also, our “Prestige” brochure is available on the “ Guides and support ” page or at a Mirage dealer near you. I’ve always had site-finished hardwood floors in my home, but I hear that there are better finishes available. What makes the Mirage finish more wear-resistant than a site-finished floor? The Mirage Nanolinx finish is clearer, more wear-resistant, and more flexible thanks to the use of infinitely small, cross-linked nanoparticles. Nanolinx is five times more wear-resistant than most finishes on the market. See the “ Finishes ” section for more information. A friend of ours has installed a radiant heat system in her bathroom, and I love the feel of the warm floor. I’m redecorating my living room and I’d like to install such a system. Can I install Engineered flooring over radiant heat? Absolutely. Our Engineered and Lock products can be installed over radiant heat, except for Brazilian Cherry (Jatoba) and Hickory. They should not be installed over radiant heat because of their physical properties. See your Mirage installation guide for more details. I had Mirage hardwood flooring installed a few months ago and I noticed that it dents when my 3-year-old drops a heavy toy on it. Why is my floor denting? Hardwood flooring is meant to last a lifetime, but some care is required in order to keep it looking its best. A dent is caused by the wood fiber being compressed. The hardness of the wood will determine the pressure required to cause an indentation. Some floors will dent more easily than others since the hardness of the wood varies according to species. For example, maple is 12% harder than oak. See the “ Species ” section for details on the hardness of each one. I’m building my new house and I want to put down Mirage hardwood everywhere except the bathrooms. What subfloors would you recommend? Mirage Classic floors can be nailed or stapled, and Engineered floors can be glued or stapled over 5/8" (16 mm) thick plywood or 3/4" (19 mm) OSB board, if installed over a 16" (400 mm) center-to-center joist substructure. In addition, Engineered flooring can be glued down over concrete. See your Mirage installation guide for more details. I’ve always used cleaners that contain waxes to clean my floors, but now that I have a Mirage floor I want to make sure I clean it with the right product. What should I use? For best results you should vacuum or sweep your floor regularly to remove the dust and grit, and then use the Mirage Clean Maintenance Kit. Never use cleaners that contain waxes as they may cause wax buildup on your floor. 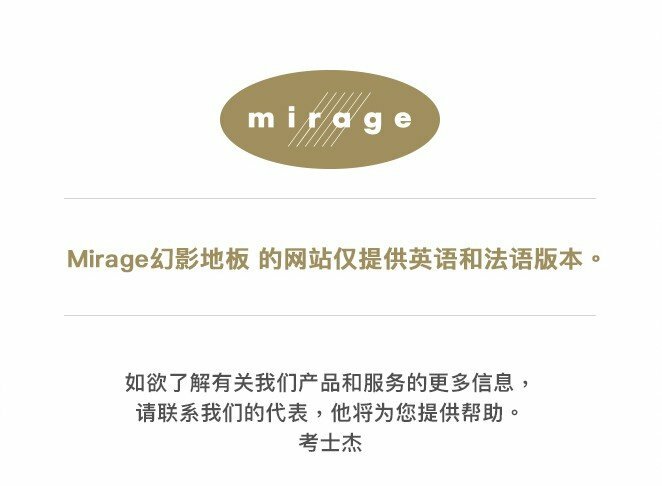 You can find Mirage Clean products at your Mirage dealer or purchase it online on our website : www.miragefloors.com. Can I use a steam cleaner on my Mirage floor? Steam cleaners are not recommended for use on Mirage floors. Mirage floors are created by installing a number of individually sealed boards. Moisture from the cleaning machine could potentially get between the boards and damage the floor. 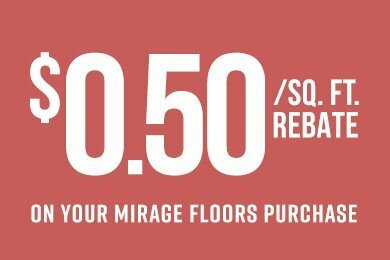 For best results, we recommend using the Mirage Clean Maintenance Kit available at your nearest Mirage dealer or purchase it on our website: www.miragefloors.com. There are many probable causes that could explain a squeaky/noisy floor. If the subfloor is not properly set, the material or the underfloor supports are inadequate, the floor can squeak. The noise that comes from the floor can also be caused by an improper nailing. It is likely that noise can occur if the floor is subjected to excessive moisture or excessively dry conditions.